Hey, footballers! We've made a number of minor updates to keep you playing your best football. We’ve also: • Added a warning when you are approaching the inventory limit – if you reach or exceed the inventory limit, you’ll need to clear space before you can resume standard game features • Fixed an issue where players in a lineup were not counted against the inventory limit Thanks for playing! FIFA Mobile has been reimagined to bring you the most authentic and exciting mobile soccer game you’ll ever experience! Get a free Cristiano Ronaldo item to start building and managing your team. 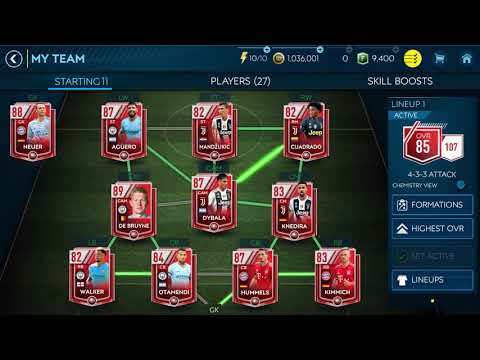 Train any player to superstar status, attack opponents, and keep coming back for daily content al... see more FIFA Mobile has been reimagined to bring you the most authentic and exciting mobile soccer game you’ll ever experience! Get a free Cristiano Ronaldo item to start building and managing your team. Train any player to superstar status, attack opponents, and keep coming back for daily content all season long. Plus, get into the game on the go with a download size of under 100 MB. Whether you’re a savvy veteran or just starting out on the pitch, FIFA Mobile is your source for soccer. Develop the most competitive squad when you choose any 11 players from over 550 real teams, including stars from past and present, and train them to over 100 OVR. Add depth to your roster, manage your lineup on the fly, and quickly tweak tactics before every match. Make the right calls and watch your club become the Ultimate Team. Take on thrilling matches that drop you into your offensive possessions with VS Attack mode. This innovative level of competition kicks your game into high gear while you strive to dominate 90-second matches, climb the leaderboards, and earn seasonal rewards year-round. Stay connected to real-world soccer as it happens across the globe. Test your skills in single-player Campaign mode, then challenge yourself with uniquely themed Events where you can earn incredible prizes. Participate in Leagues, a truly social experience that allows you to join forces and strive for glory with friends and gamers around the globe. Test your skills in inter-league championships, or take on the best gamers worldwide in League vs. League Tournaments to climb the leaderboards and prove your talent on the pitch. Visit http://help.ea.com/en/# for assistance or inquiries. EA may retire online features after 30 days’ notice posted on ea.com/service-updates.